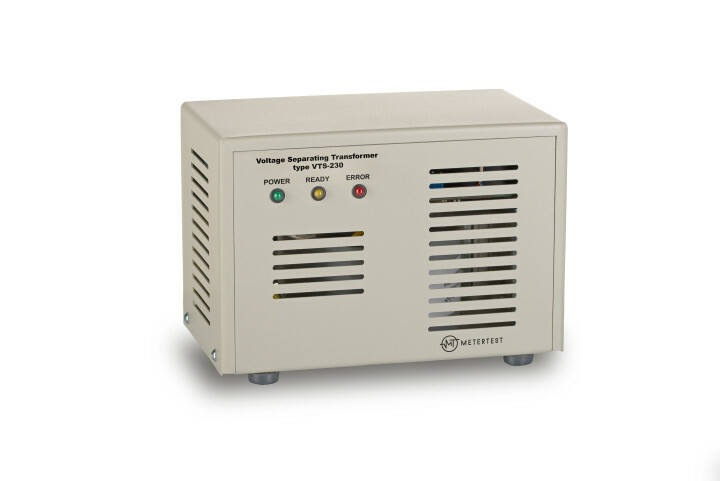 The VTS high-precision voltage separating transformer was designed for the galvanic separation of measuring circuits. The built-in electronic compensation system guarantees excellent parameters throughout the entire voltage range, ensuring simultaneous high output power. A typical accuracy of ±0.01% makes the device an ideal solution for a wide range of applications. Among them, is the potential to use the VTS for testing single-phase energy meters with closed I-P links i.e. meters with connected current and potential circuits. A broad range of working voltages, high output power and high accuracy enable the VTS to be permanently integrated within a meter testing system. Once integrated, it can accommodate a diverse array of meters, (including those with open links) with negligible influence on overall system accuracy. Of special note is the fact that the VTS, unlike passive transformers, copes superbly with non-linear loads, something typical modern electronic meters cannot do without lessening measurement accuracy. This device is designed to test single-phase meters.